I had talked about some stock picking strategies in our previous blogs. In that, I had mentioned a stock picking strategy called the Dogs of Dow. Dogs of Nifty applies the same stock picking strategy on the fifty stocks of the NSE Nifty index. The idea is to identify ten stocks that have the highest dividend yield among the fifty nifty stocks, build a portfolio by investing equal amounts in each of them. Hold the stocks for one year and one day and rebalance the portfolio. While rebalancing the portfolio, you will have to sell off the stocks that are not in the list of ten high dividend yielding stocks of the time and also make sure that all the stocks have equal weight in terms of capital invested. But before we jump in to identify the stocks, let look at this strategy in brief and also its pro and cons. Dogs of Dow is a stock picking bought into the limelight by Michael Higgins through his book "Beating the Dow". The basis of this strategy is that index stocks are fundamentally strong and capable of withstanding any market upheaval. High dividend yields indicate that the stock is relatively cheaply priced but management is confident about the companies performance as the dividends haven't gone down. Does not perform well during bull runs. Lot of assumptions, many which may not hold true as time changes. 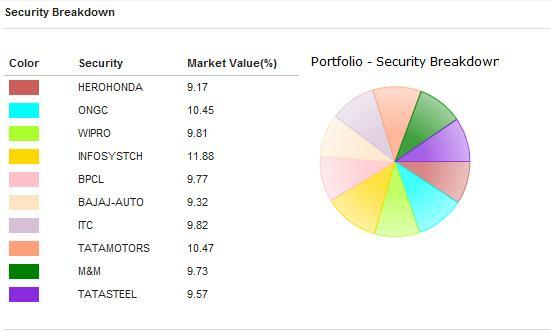 Following is the list of 10 stock that makes up the dog of nifty. Next task is to construct a portfolio by investing equal amounts in each of the ten securities. Practically, one will not be able to invest exactly equal amounts in each of the securities as buying fractional units of a stock is not possible. So one will have to round off to whole number unit values, which I believe should be OK.
An investment portfolio constructed on 1st of Nov 2010 by investing Rs 10,000 on each of the securities is as given below. Now we have a Dogs of the Nifty portfolio, we will leave this as is for one and one day. 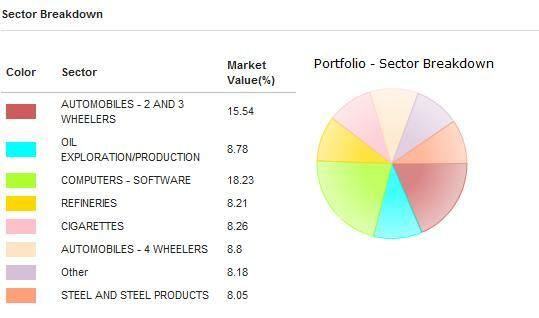 We should revisit this portfolio on Nov 2nd, 2011 to rebalance the portfolio. Any profit booking or loss harvesting will have to wait till that date. I have created this portfolio using finahub.com and has published a model so that all finahub.com users can track this model to see how it performs over time. As of now, models are visible to logged in user alone. Please note that the above portfolio was created for studying the Dogs of Dow investment strategy and how it can be applied to the Indian investment scenario using NSE Nifty as the base index. 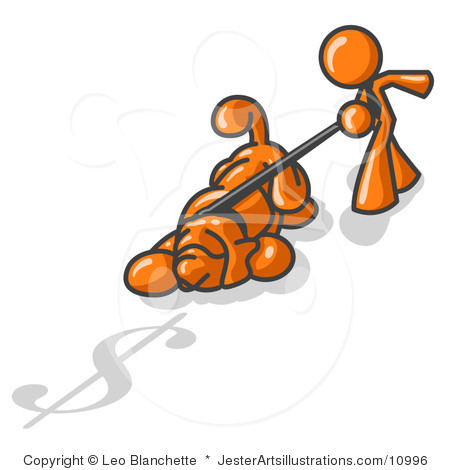 This should not be used as is for making the actual investment. Please do the required research and due diligence before making any investment.